As most of you already know, I have moved my blogging ability over to SB Nation’s Viva El Birdos. I am so grateful for the amount of opportunities I have had since joining Viva El Birdos. I have been able to interview many of the Cardinals top prospects: Lee Stoppelman, Kurt Heyer, Joe Cuda, Alex Reyes, Carson Kelly, Rob Kaminsky, and Oscar Mercado. I still have interviews set to publish on Marco Gonzales and Randal Grichuk later this week. If you have missed any of the above interviews or just would like to read them again, feel free to check them out by clicking on the player’s name. Each one of those interviews have been absolutely awesome. However, I am writing this post to bring your attention to the biggest interview I have had in my short blogging career. I was able to exchange questions and answers with St. Louis Cardinals hybrid pitcher, Joe Kelly, and the link to that interview can be found here. I can assure you that this interview is in the “must-read” category for all Cardinals fans because some of his answers are absolutely priceless. You can follow us on Twitter: @vivaelbirdos or Facebook: Viva El Birdos. Thank you so much for your continued support, and I hope you have continued to follow me at my new location. As most of you already know, I have officially taken my blogging to Viva El Birdos, SB Nation’s Cardinals site. If you have not been able to keep up with my posts from this week, I have provided a comprehensive list (including links) below. Some players I took a look at include Yadier Molina, Matt Holliday, Shelby Miller, Lee Stoppelman, and MLB Draft prospect, Kodi Medeiros. 2. What should we expect from Yadier Molina’s hitting in 2014? 3. Have Matt Holliday’s hitting zone patterns changed with age? For the time being, I will compose pieces like this one as my readers make the transition over to Viva El Birdos along with me. As I write this post, I am feeling a lot of different emotions. I started this blog last May out of love for the game of baseball and especially the St. Louis Cardinals. Given the fact that I had not written anything in four years (since my high school days at SLUH), I was floored by the support I received from each and every one of you. To be honest, I thought I was going to start blogging, write for a few months, and annoy the heck out of my few readers. Then, I would see the “writing on the wall,” quit blogging, and stick to being the “super fan” I’ve been for much of my life. Thankfully, this did not end up being the case. Daniel Shoptaw, who can be found at C70 At the Bat of The Cards Conclave, welcomed me into the United Cardinal Bloggers community. Here, I gained readers who were not just my family and friends. Thus, I had to actually write good content if I wanted to keep people coming back to read more. This was important to me because I knew my family and friends would say my content was good (even if it wasn’t) just because they cared about me. It was even more meaningful hearing from people I have never met saying they read almost every post I wrote. During my time with stlCupofJoe, I was able to do many things that I would have never imagined doing. I interviewed Cardinal prospects (James Ramsey, Jordan Swagerty, Kurt Heyer, and Carson Kelly). I interviewed Cardinal scouting director, Dan Kantrovitz, who was extremely thoughtful in his responses and has been an invaluable resource ever since. I interviewed great baseball mind, Dan Szymborski, and MLB insider prodigy, Chris Cotillo. I thank all the people I worked with and collaborated with along the way, especially John Nagel of CardinalsFarm and Corey Rudd of STL Sports Minute. We have talked Cardinals baseball so much in the past eight months. Probably too much, but who can blame us? Cardinals baseball is a wonderful thing. They gave me topics to explore, critiqued my work, and helped me gain traffic on my site. All writing/blogging aside, I will be forever grateful for my cousin, Christine Kenney, who was the genius behind the creation of my logo (can be seen at the top of this page). Christine volunteered and created four different choices for me within a few hours. She is absolutely amazing at what she does, and like I said I will be forever thankful. The logo she made has since been turned into t-shirts, business cards, flyers, notebooks, and much much more (thanks to my sister, Julie). 1. What should we expect from Yadier Molina’s hitting in 2014? 2. Have Matt Holliday’s hitting zone patterns changed with age? This is not good bye. Partially because I hate good byes, and partially because I hope you find yourself checking out my posts in their new location. Feel free to make an SB Nation account and join in the conversation in the comments section. Finally, as with anything, I have absolutely no idea what the future holds. I will be keeping my domain, http://www.stlcupofjoe.com, open in case I ever have anything non-Cardinal-baseball related to write about–such as the Butler Bulldogs, Indianapolis Colts, Indiana Pacers, St. Louis sports, or life in general. I hope to write at SB Nation for years to come, but if this turns out to not be the case, I will return here to write more Cardinal content. Thank you so much. Your continued support truly means so much to me. St. Louis, and much of the Midwest, is cold right now. Really cold. With six to twelve inches of snow falling across the area today and below zero temperatures expected tomorrow, I figured it was a perfect time to write about Cardinals’ flame-throwing closer, Trevor Rosenthal. Have you ever taken the time to look at the raw data of his pitching in 2013? I glanced at it in a previous blog post, but that was mid-season when he was still the set-up man, so let’s see how he progressed as the season went along. Let’s face it. With the way the weather is outside, our minds are craving baseball. However, unfortunately, it is still over a month away till Spring Training. I will start by taking a look at Rosenthal’s phenomenal outing on October 12th in Game 2 of the NLCS against the Los Angeles Dodgers and then move on to his numbers from the season as a whole. This at-bat consisted of seven straight fastballs which can be damning to some pitchers. However, with pitches ranging from 97.4 MPH to 99.6 MPH, Rosenthal can afford throwing this many in a row, as long as he locates them well. Throughout much of the regular season and especially the playoffs, hitters knew what to expect from Rosenthal–a fastball. To combat this, Rosenthal did exactly what I just noted, changing location consistently–up-down-in-out–throughout the Puig at-bat. When the seventh pitch rolled around, Puig had a pretty good idea it was going to be a fastball, but he had no clue on its location–leading to a good ole backwards K. Puig had a .315 batting average and a .519 slugging percentage against fastballs this season, but those most definitely weren’t Rosenthal-like fastballs. An average of 99.3 MPH? That’s not even fair. 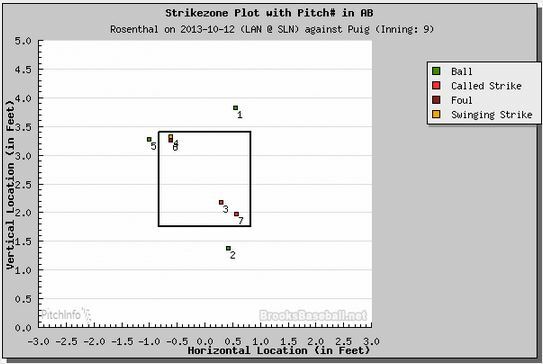 Two of the four pitches (pitches 3 and 4 of the at-bat) resulted in whiffs. Uribe was a .315 hitter against fastballs in 2013, but as I noted, a Rosenthal fastball is in a whole different class–an elite class shared by very few pitchers in the league. 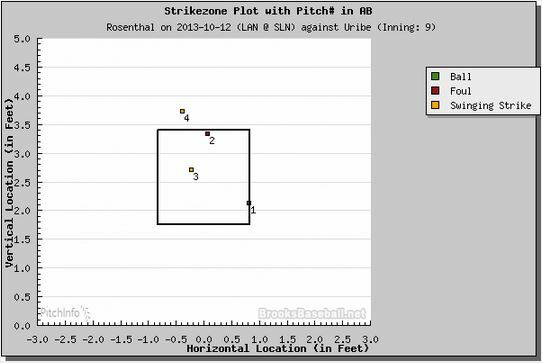 As if the 99.5 MPH average wasn’t enough, Rosenthal changed Ethier’s eye-level on all three pitches–the first pitch being down in the zone, second one up in the zone, and then finished him off with one near the middle of the zone. Ethier swung and missed on all three, and if I remember correctly, he looked pretty foolish on each one. With pitch number two coming in at 101.2 MPH, I wouldn’t be surprised if that was his fastest all season. 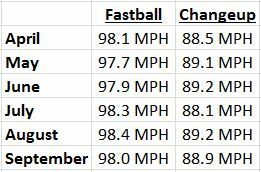 As you can see in the table to the right, Rosenthal’s velocity was pretty consistent all season. If anything, he ramped it up a little bit as the season went along. The 10 MPH difference between his fastball and changeup will be devastating for years to come, especially as he gains confidence in his secondary pitches. I know Rosenthal has made it clear he wants a shot in the starting rotation. Mike Matheny and Derek Lilliquist just may give him the opportunity this spring. However, I legitimately believe he will go down as one of the best in the game if he stays in the closer role and is able to stay healthy. He is only 23 years old. His fastball is already elite. We all know this. However, his secondary pitches, especially his changeup, have also shown flashes of brilliance as well. 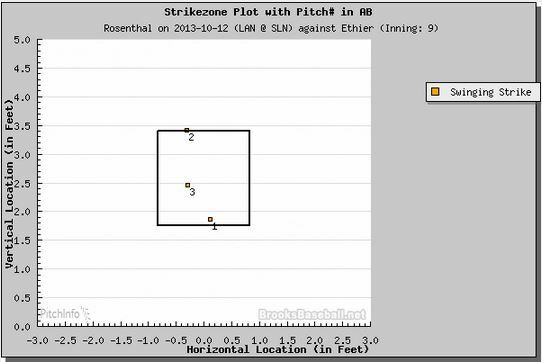 With Rosenthal’s work ethic, I expect him to have these pitches fine-tuned and ready to go next season. Sorry, Major League hitters. You are in for quite the treat for years to come. As usual, all pitching data was received from BrooksBaseball.net. If this is of interest to you, check the site out for yourself. If you have any questions, feel free to ask! A guest post by Jared Simmons. You can find him on Twitter: @McGeeTriples. 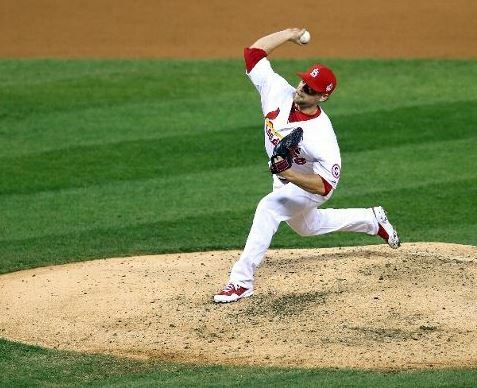 The glut of young, power arms possessed by the St. Louis Cardinals has been well documented. Some fans have called for the organization to maximize the value of their assets and relieve the rotation’s logjam through a trade. However, I have always believed the old cliché about never having too much pitching. So, how then, can the Cardinals get the most value out of all their young arms when they can’t all fit into a five-man rotation? The odds of Martinez beating Kelly or Lynn out for the 5th and final rotation spot appear slim and honestly, seem undesirable. Where can Martinez impact the game the most? I would argue that the gap in production between any of these three in the 5th starter role would be negligible over the long season. Further, the 5th starter is unlikely to see a start in postseason play and therefore asked to step into a role that he has not performed in all season. I want Carlos Martinez to pitch early and to pitch often when the postseason rolls around. The late-inning relief roles are stocked with good pitchers. Trevor Rosenthal, Jason Motte, and Kevin Siegrist are flame-throwers and should be able to hold down the fort in the 7th, 8th, and 9th innings pretty efficiently. As a result of these surpluses the Cardinals have the luxury of breaking the mold or returning to the old mold–if you prefer–and using Carlos Martinez and his electric arm as a super reliever. Let’s define “super reliever” for the purposes of this blog post: a super reliever is a relief pitcher whose role is not tied to a particular inning. Today, closers pitch the 9th and setup men pitch the 7th or the 8th innings. If anything different is asked of these players, they lose or their agents lose their minds on their behalf. Saves and holds earn dollars. Meanwhile, games are lost in the 5th inning when a starter loses his mojo and gets in a jam. Or the sixth with the bases loaded and a two run lead, does the manager call the bullpen for his best guy knowing that this is the confrontation that will likely determine the outcome of the game? Instead, the manager calls for Seth Manness. Or Fernando Salas. Or Maikel Cleto. When this happens, the odds of losing the game skyrockets—all because the manager is paralyzed by fear and handcuffed by convention. The “super reliever” eliminates this scenario because his role is to put out the fire whenever the flame sparks. The super reliever is just like the closer—only more flexible, more durable, and more valuable. If the game is on the line in the 6th, this man (Carlos Martinez) will slam the door. If Trevor Rosenthal has pitched 3 straight days, Carlos Martinez will save the game without breaking a sweat. If a game goes into extra innings and all other bullpen options are exhausted, the super reliever will go 3 innings, shut the door, and send the crowd at Busch home happy. The super reliever is also not tied to an arbitrary one-inning limit. He pitches as needed, and gives way when the situation dictates that he should. And because he’s not tied to an inning or a particular situation, he is free to do this—as tomorrow the setup men and the closer will still be there to do the overrated, overvalued, and overpriced task of coming into their predefined inning with a 3 run lead, no one on base, and retiring the opposing 7, 8, and 9 hitters for the 29th best team in baseball. The super reliever is the leverage reliever. The man to pitch anywhere, anytime as long as the outcome hangs in the balance. The bullpen arm who can count for two roster spots and determine the difference between winning and losing. For the Cardinals, this man is or rather should be Carlos Martinez with his electric fastball and devastating slider. A man with a reliever’s arm and a starter’s stamina. His career ahead lies in the rotation, but for now, with the excess of young arms already on the roster, his most potential impact is in this unconventional role I just described. I believe Carlos Martinez has a rare gift in his right arm. In my view, C-Mart has the stuff to become a legendary figure in the annals of Cardinal pitching lore – if only he is able to refine his command and remain healthy. As such, I hope the Cardinals will utilize him in as many game-deciding situations as possible. With the traditional bullpen roles in good hands and the long-relief/mop-up role being handled by the odd man out of the rotation (Lynn or Kelly) the most efficient way to capitalize on C-Mart’s talent will be in the same way that old school closers were used: 100-120 innings of flame-throwing, season-defining, high-leverage relief. • It allows the greatest number of the team’s bullpen innings to be pitched by the team’s best pitchers. • Gives Manager Mike Matheny the ability to ration the workloads of Motte, Siegrist, Rosenthal, and even Seth Maness (whom Matheny loves for some reason). This is important because for the 2014 St. Louis Cardinals, the goal is winning a World Series. And NOT in the same way that it’s the goal for every team in the MLB. Really winning a World Series. Barring catastrophe, the regular season is just a formality the Cardinals have to wade through on their way to October. So, having your power arms fresh and peaking at playoff time is of more concern than how well they can play in April. • Rations C-Mart’s innings. The Cardinals, like most teams, are concerned with preserving their young arms for the long-term (Note Shelby Miller’s disappearance from the playoffs). Being able to manage Carlos’ innings throughout the season will hopefully eliminate any desire to hold him back in October. • Ensures that the bridge from the starter to the shutdown portion of the bullpen is as smooth as possible. There’s value in the middle innings. Close games are often lost in the 5th or 6th innings. Big leads are lost nearly every time Fernando Salas steps on to a major league mound. It also limits the desire of modern managers to trot every member of a bullpen into every single game until they find the one guy who is going to have a bad day. C-Mart is easily capable of going 2-4 innings at a time on any given night. • Gives the Cardinals roster flexibility. Martinez’s ability to pitch so many innings out of the bullpen means the Cardinals don’t have to carry as many pitchers if they don’t want to. Or if they choose to carry 12 pitchers—they don’t have to use them as often. 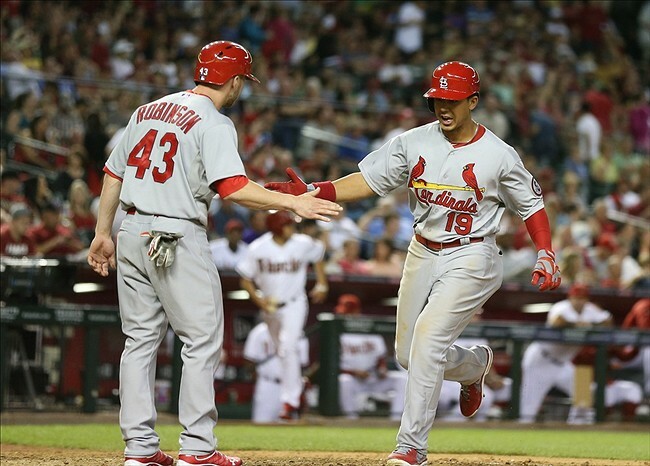 The Cardinals have a lot of different ways they can go with Carlos Martinez in 2014. They afforded themselves this luxury because of half a decade’s worth of smart decisions in free agency, the draft, international pool, and with their own players. Carlos Martinez is a weapon they can use from the 5th inning to the 9th inning. He should be used in tight games, and he should be able to rack up a ton of relief innings. If you make him the “eighth inning” guy, you are unnecessarily limiting him and are probably only going to get 60-80 innings out of him. More innings = more value. Pitcher’s with elite arms like Martinez have not generally been used in this manner since the 80’s, but the presence of Motte, Siegrist, and Rosenthal means that they can deploy Martinez anytime, anywhere and still be covered at the end of the ballgame. On December 31, 2013, MLB.com columnist, Phil Rogers, wrote one of the sloppiest sports articles I have ever read in my 23 years of life. In the post, Rogers took the time to review 15 teams’ offseasons–five as “Most improved,” five as “Most damaged,” and five as “Incomplete.” The link to his full MLB.com post can be found here if you are interested in checking it out yourself. Mr. Rogers, what does your first sentence even mean? Isn’t every team “best judged over 12 months, not just the offseason?” Last time I checked, the commissioner’s office doesn’t hand out World Series trophies in the winter. I would argue this opening statement more, but I honestly have no clue where to go from there. Sure, Carlos Beltran has moved onto the New York Yankees, and his bat and leadership will definitely be missed. However, the purpose of the Bourjos trade was not to replace the hole left by Beltran. Bourjos was acquired to provide better range in center field and better speed on the base paths. Given his wrist returns to full health (and all signs from the organization point to this being the case), the Cardinals’ scouting department believe his bat will be just fine and hopefully provide more pop from the position–especially with regular plate appearances–something he did not receive while on the Angels. Now that we have discussed Bourjos’ true role on the team, let’s revisit that “hole in the middle of the order” you speak about. If Beltran had re-signed with the Cardinals, you’re assuming Beltran would be hitting in the middle of the order? Well, 62% of his plate appearances in 2013 occurred from the 2-hole in the lineup–not the middle of the order. As long as Matt Carpenter remained the team’s lead-off hitter, this would have likely been the same in 2014. As you can see by the totals (highlighted in green), there really isn’t that much of a difference between the two combinations if Adams gets 500 plate appearances next season. Single-digit differences in every single category, with the Craig-Adams combination actually having two more doubles. Thus, is the “middle of the lineup” really that much worse going into 2014? Sure, projections are just projections and many things could happen between now and opening day, but it’s the best we have right now. Frankly, it is irresponsible for an MLB.com writer to write such a comment about a team without at least first checking the data that’s very easily available to him. “Carpenter’s innings can be easily replaced by the stable of young arms.” Really? You’re still talking about this going into 2014. I think Carp’s innings have already been replaced, Mr. Rogers. He pitched ZERO innings in 2013 and was only able to grind his way through a mere 17 injury-ridden innings in 2012. You think Martinez will for sure take over in the starting rotation? I think Lance Lynn and Joe Kelly will have something to say about that. Is Martinez’s future in the rotation? I really do think so, but the start of 2014 may be a stretch. Does he have an opportunity? Of course he does, but he’s far from the shoe-in for the spot that you make him out to be. Carp was one of the pitching staff and team leaders, arguably even more so than Shields was for the Rays, but what about Adam Wainwright? What about Yadier Molina? Did you watch any Cardinal games last year? Molina almost single-handedly guided a pitching staff full of rookies all the way to the World Series. Ask Shelby Miller his opinion of Molina. I promise you will hear nothing but utmost praise for the catcher. Wainwright watched many pitchers’ (especially the rookies) bullpen sessions and gave advice where he deemed necessary. Will they miss Carpenter’s presence? Of course they will, but last time I checked, they have fully capable leaders who have already taken over during the transition process. Finally, let’s address your final point. To be honest, I really don’t care how far Peralta falls in production post-Biogenesis suspension–if he falls at all. Pete Kozma was one of the most frustrating hitters to watch last season, and I can assure you, PED-aided or not, Peralta can hit a baseball at a much more successful rate than ole Petey. Kozma had a .275 on-base percentage and hit one home run in 2013, and it occurred in the second game of the entire season. In Peralta’s 10-year career (a more than adequate sample size in my opinion), his lowest on-base percentage was .295, and this occurred in just 77 games during his rookie season. He averages just over 14 home runs a season–an amount that I doubt Kozma reaches in his career. Let’s take a look at a point you did not look at as well–the improved defense compared to 2013. With Carpenter moving back to his natural position at third, Kolten Wong or Mark Ellis playing second, and Peralta making all the standard plays, the infield defense is much better than it was last season. A quick look at the UZR’s of these players at these positions makes this quite clear. What about the outfield? Holliday and Craig may be average to below-average defenders in the corners, but this is where Bourjos’ range in center helps immensely. I would provide concrete numbers to back up these defensive points, but this post is already much longer than I had expected. stlCupofJoe: In YOUR opinion, compare this year’s Cardinals (I realize some more deals may be made) going into the season to last year’s team. Which one is in a better position, projection-wise? Dan Szymborski: I think they’re a better team, as frightening as that may be to the rest of the NL. Remember, they only got 9 starts from Michael Wacha during the regular season and a whole lot of starts from the Great Kozmandias (Look on his bat, ye Mighty, and despair). And they’re not even a million years old, there’s enough youth to cancel out possible age-related decline from Matt Holliday or a little regression from Yadi Molina. In conclusion, I fully respect Phil Rogers for what he has done for the MLB. He has covered the game since before I was even born. However, if he is going to write a post about the Cardinals being “most damaged” after one of the most productive offseasons in recent memory, he better at least have numbers to back up his opinions. This is a guest post written by Jared of @McGeeTriples. Thus, please read the post accordingly. Considering this topic can lead to heated debates, feel free to include your thoughts in the comments section below or by contacting either of us on Twitter. It says a lot about your organization when one of the biggest questions you have about your team on December 31st is which solid bench guy should be the 4th or possibly 5th outfielder on the roster. But that’s the position the St. Louis Cardinals and their fans find themselves in as 2014 beckons. With the bulk of the roster written in blood and holes in its construct harder to find than Tim Tebow at a key party–there’s little left for Cardinal diehards to deliberate. 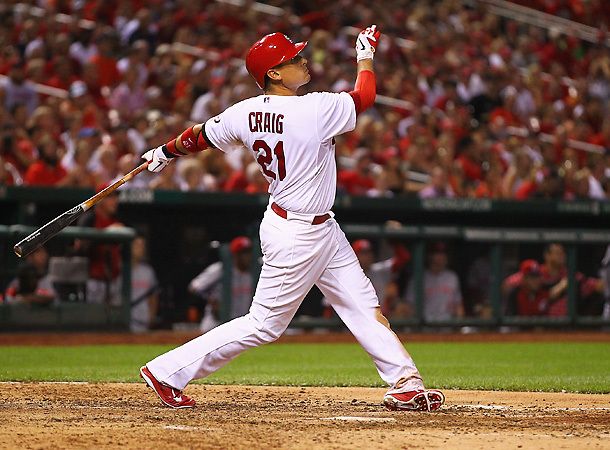 Be that as it may, St. Louis is a town where baseball sits ever on the conscious, and thus a debate rages among the more far gone addicts about who the better player and fit will be for the Cardinals in 2014: Jon Jay or Shane Robinson. There is a strong contingent among us running the flag up the pole in support of Shane Robinson. Among that group there are two sub-groups: those with intelligent, well-reasoned and valid arguments for backing Robinson, and a second group racing to be first in line to support any diminutive, “gritty” player who gives them warm fuzzy feelings, and makes them believe that THEY TOO can become great. You can count me out of both groups. While I acknowledge that Robinson was a better defender than Jay in 2013 (and by a wide margin), it is clear to me that Jay is the better baseball player and the better fit for the Cardinals’ roster as presently constructed. This argument is built on analytics, advanced baseball metrics, and old-school eye test reasoning. I fully respect Robinson and what he has accomplished in life. Most of us would be lucky to get out of our gifts what Shane has produced from all 5 feet, 5 inches of his body. That said, Major League Baseball and professional sports, in general, are a zero sum game. There are no points for being the best pound-for-pound and no moral victories. Feel-good stories are made for TV only. ESPN will nauseate you to death with heart-wrenchers and baby-mama drama. Yet, the fact remains that in the business of baseball, the sole measure of success is winning and losing. Jay’s defense drew much ire in 2013 and rightfully so. He had a UZR of negative 7.3 (beyond terrible). By contrast, Robinson’s UZR was a positive 4.0. While defensive numbers can be hard to quantify–the stark contrast in those zone ratings is hard to ignore. The questions that all concerned parties must answer is whether or not at the age of 28 (generally considered to be a prime year in a player’s career), has Jay completely lost the ability to play defense? After all, in the prior year he played a solid CF, and his UZR was a respectable 3.7 (nearly identical to Robinson’s 3.6). I tend to think that the awfulness that was Jay’s defense in 2013 was an outlier and that given playing time in 2014, he would be more slightly below average and less albatross than he was in 2013. Robinson also has a decent arm; while Jay terrifies no one with his wet noodle. I won’t offer you any numbers here, but ask yourself this question, how often does an averaged-armed starting outfielder impact a game with a throw? The answer is rarely. And if that guy isn’t playing very much, this impact is almost nonexistent. And let’s not kid ourselves, Robinson is an averaged-armed outfielder. Rick Ankiel, he is not. The best fit for this team is going to be the player that hits the most. Matt Holliday, Peter Bourjos, and Allen Craig are going to patrol the outfield for the Cardinals for the most part in 2014. If one of those three (or Matt Adams) suffers a long-term injury, then the bulk of the playing time created will likely fall into the lap of Oscar Taveras. As a result, the opportunities for either Robinson or Jay to impact games are going to be few and far between, and they are also going to come in the form of pinch-hits. I tend to favor CAIRO’s projection for Robinson as I believe that given full-time at bats, he would struggle to post a .700 OPS. Obviously, this is just one man’s opinion. I like the middle ground here with Steamer’s projection for Jay in 2014. In case you haven’t noticed, Jay is also left-handed and the Cards’ entire projected starting OF is full of RH hitters. Coveting a roster composition of diverse skill sets is another feather in Jay’s cap. But perhaps the most decisive reason for Jay over Robinson is potential value. In short, Robinson has none and is never going to have any. Perhaps, only Jeff Luhnow in Houston would covet Robinson’s services. After all, he also wanted Tyler Greene. Jay on the other hand, has established value in the major leagues. Even last year, as his defense completely tanked, Jay was basically a league average player. According to Fangraphs, he had a WAR of 1.9. Robinson posted a WAR of just 0.9 in limited playing time and would likely have seen that number decreased had he seen extensive exposure. Jay’s bat, and likely defensive rebound offer the most upside both in terms of tangible value to the Cardinals and speculative value as a trade chip mid-season. Jay is a fringe starter and solid 4th outfield option. Robinson is a AAAA player. We all want to cheer for the little guy and pull for the underdog, but the Cardinals are best served by making calculated decisions. Not emotional ones. John Mozeliak has wreaked havoc on professional baseball by remaining steadfast in this approach (buh-bye David Freese), and we can only hope that he continues to do so by maximizing the assets at his disposal. Jon Jay is an asset. Like I said before the post, feel free to include your opinions in the comments section below. Both Jared and I would love to see conversation result from this this post.